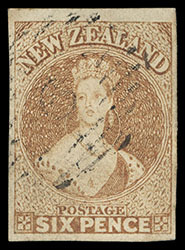 New Zealand, 1859, Queen Victoria "Chalon Head", 6d bister brown on soft white paper, imperf, unwatermarked, full even margins all around, beautiful color on bright paper, numeral "1" barred oval of Auckland, small thin spot, fresh and Extremely Fine appearance. Scott No. 9e. Campbell Paterson No. A5a (2). SG No. 12 £500 ($660). 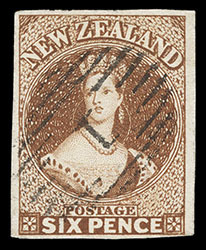 New Zealand, 1859, Queen Victoria "Chalon Head", 6d pale bister brown, imperf, unwatermarked, large to huge margins, bright color, light indistinct numeral barred oval, Extremely Fine and choice. Scott No. 9e var. Campbell Paterson No. A5a (9). SG No. 12 var. £500 as normal ($660). Joseph Hackmey, Spink Shreves, February 2009, lot 1081; with 1988 Holcombe & 1991 B.P.A. certificates. Scott No. 9. Campbell Paterson No. A5a (10). SG No. 13 £3,250 ($4,270). 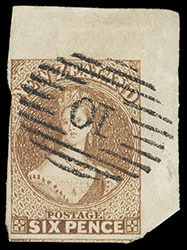 A CHOICE UNUSED EXAMPLE OF THE 1857 6D BROWN ISSUE WITH HANDSOME COLOR AND OUTSTANDING MARGINS. 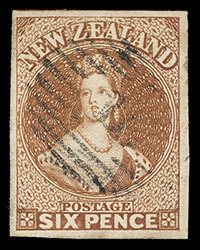 New Zealand, 1857, Queen Victoria "Chalon Head", 6d deep brown on thick paper, imperf, unwatermarked, perfect sharp numeral "1" barred oval of Auckland, full to large margins except just clear at bottom right, deep intense color and impression on bright white paper, Very Fine and choice shade variety. Scott No. 9. Campbell Paterson No. A5a (3). SG No. 13 var. £300 ($390). 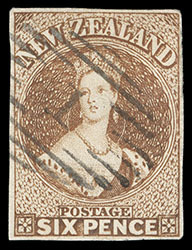 New Zealand, 1857, Queen Victoria "Chalon Head", 6d brown on thick soft paper, imperf, unwatermarked, large to huge margins all around including adjacent stamp at bottom, strong color on bright paper, central strike of numeral "18" barred oval, fresh and Extremely Fine gem, H. Gordon Kaye, Christie's Robson Lowe, April 1991, part of lot 244. Scott No. 9. Campbell Paterson No. A5a (4). 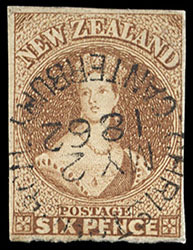 New Zealand, 1857, Queen Victoria "Chalon Head", 6d reddish brown, imperf, overlap at top and "D" flaw of "Zealand", unwatermarked, full to large margins, overlap at top showing short printing, brilliant color and sharp impression on bright paper, neat numeral "1" barred oval of Auckland, fresh and Very Fine. Scott No. 9 var. Campbell Paterson No. A5a (4) var. 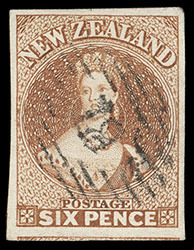 New Zealand, 1857, Queen Victoria "Chalon Head", 6d brown on thick paper, imperf, unwatermarked, cancelled by numeral "10" barred oval of Wellington, large to extra large margins, strong color and impression, an Extremely Fine gem, H. Gordon Kaye, Christie's Robson Lowe, April 1991, part of lot 236. Scott No. 9. Campbell Paterson No. A5a (4). 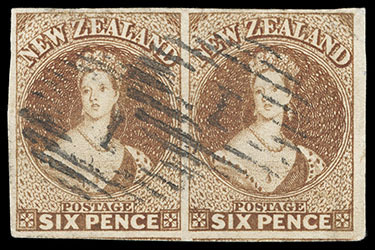 New Zealand, 1857, Queen Victoria "Chalon Head", 6d brown, imperf, unwatermarked, horizontal pair (R. 2/2-3), large to huge margins all around showing part of adjacent stamps at bottom, strong color on bright paper, each stamp cancelled by numeral "1" barred ovals of Auckland, small thin spots and faint horizontal crease, fresh and Extremely Fine appearance. Scott No. 9. Campbell Paterson No. A5a (4). SG No. 13 £600 as singles ($790). 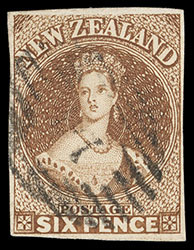 New Zealand, 1857, Queen Victoria "Chalon Head", 6d tan brown, imperf, unwatermarked, full to large margins, cancelled by socked-on-the-nose "Christchurch, Canterbury, MY 2, 1862" rimless cds, Very Fine and choice town cancel, a rare shade. Scott No. 9. Campbell Paterson No. A5a (6). 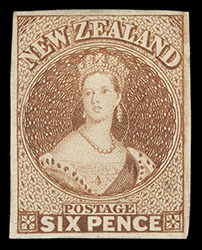 New Zealand, 1857, Queen Victoria "Chalon Head", 6d brown on thin white paper, imperf, unwatermarked, huge corner margin single (pos. R. 1/12), touched at one spot at left, strong color and sharp impression, cancelled by bold numeral "10" barred oval, Very Fine and eye appealing. Scott No. 9. Campbell Paterson No. A5a (10).